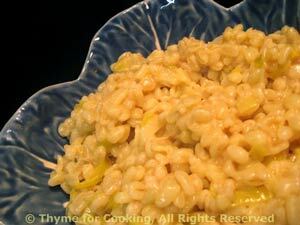 Barley, risotto-style, with Green Garlic, Thyme for Cooking gourmet sides. We try to eat a variety of grains. I have always loved barley in soup... why not as a side dish? If you don't have it or like it, substitute Orzo, everything else the same. My barley cooks in 15 minutes, check your package and increase cooking time if needed. Add garlic/leek and sauté for 2 minutes. Add barley, wine, stock and bring to a simmer on medium heat. Turn heat to low and simmer until done, stirring occasionally. All stock will be absorbed. Remove from heat and serve. It should be loose and creamy, if not add a bit more stock.